July 27, 2015 12:38 pm. Horse racing, more than ever, is a truly international sport. Horses, trainers and jockeys know no boundaries in 2015. Leading Aussie jockeys like James McDonald and Hugh Bowman are as likely to ride a winner in Hong Kong as Sydney. When the Melbourne Cup carnival rolls around all the biggest names come to Australia for our biggest races. Here is HorseBetting.com.au’s list of the greatest jockeys of all time. The South American born Moreira has set the world on fire since bursting onto the scene in Hong Kong in 2013 and continues to go from strength to strength in the racing world. He’s won international jockey challenges, Hong Kong miles and cups, big races in Dubai and all over Europe. The ‘magic man’ has an uncanny knack of getting the most out of his horses. Compound that by a decisiveness in the saddle and brilliant tactical mind that can read a race and change accordingly within seconds, it is easy see why many rate Moreira as one of the world’s very best. Is there a more recognisable name in Australian racing than Damien Oliver? The man with a movie about him is never far from the news headlines. The champion jockey has won just about every major race there is to win in the country, taking out the Melbourne cup three times, the Caulfield Cup four times and the Cox plate once. The man they call ‘Ollie’ has had a sparkling career outside the big races too, with the 43-year-old a seven-time recipient of the Scobie Breasley Medal, which recognises excellence in race riding at metropolitan Melbourne tracks. Oliver was also the inaugural winner of the Roy Higgins Medal as the winner of the Victorian Jockey’s Championship in 2014. Not to mention the tenth Victorian jockey premiership Olly secured in 2015. When Damian Oliver eventually retires, he will go down as one of the all-time greats. Born in New Zealand, James McDonald did not take long to establish himself as one of Australia’s premier riders. McDonald arrived in Queensland as a teenager from New Zealand, and whilst he had several group 1 victories in NZ under his belt, he was a virtual unknown commodity in Australia. McDonald quickly rose up the ranks in Australia, culminating in winning Sydney’s jockey championship in 2014, as well as riding winners that netted over 13 million dollars over the same period. At just 23 years of age in 2015, McDonald has a long and successful career ahead of him, and if his form line continues he will be considered one of the all-time great riders in Australian history. If you are looking for a better story of redemption in the racing industry you would be hard pressed to go past the ultra-consistent Blake Shinn. After riding 2008 Melbourne Cup winner Viewed, Shinn looked destined for superstardom but the man they call ‘Shinny’ was suspended not long after for a year after it was revealed he had wagered over a million dollars in the racing industry. After undergoing rehabilitation, Shinn emerged through the other side as one of Australia’s more consistent riders and has since gone on to win the Doomben Cup twice. There are few better success stories in the Australian horse racing industry than Tommy Berry. After working for years as a track worker for Gai Waterhouse, Berry decided to take a punt on his career and try his luck in Hong Kong. The move paid off, with both Tommy and his brother Nathan excelling in the cut-throat world of Asian horse racing. Tragedy struck the Berry family in 2014, when Nathan heartbreakingly died due to an acute form of epilepsy. The unfortunate incident could have broken Berry, but he used the memory of his brother to spur himself on, and now sits in the upper echelon of Australian jockeys after securing wins in the Golden Slipper, the TJ Smith classic and the Doncaster Mile. One of Australia’s most decorated and prolific riders, Glen Boss is one name that seems to transcend the racing industry. Not only has he amassed an astonishing 143 million dollars in prize money post-2000, but he has a bevvy of Group 1 wins to highlight just how great a rider he really is. The history books will recognise him for being the man that saddled Makybe Diva to three straight Melbourne Cup victories, but six Doncaster Mile wins, a further three Cox Plate firsts and two successful Golden Slipper campaigns shows he is more than just a one-horse man. In 2015 Boss was inducted into the Australian Racing hall of fame, and still demands enough respect by name alone. 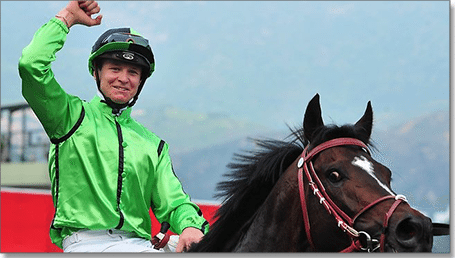 There are few jockeys around the world that can match Craig Williams on a horse, and when it comes to honing his craft, Williams left no stone unturned in his pursuit of becoming one of the best. Williams has spent time riding in the UK, Dubai, Hong Kong, France, Japan and Australia, and has consistently won races at the highest level, with 39 Group 1 victories to his name. Williams has two Caulfield Cup wins, two Cox Plates and an incredible three Queen Elizabeth Stake wins already to his name. The only thing missing from his collection of wins is a Melbourne Cup winning ride, after a careless riding charge stopped him from taking to the saddle on Dunaden in 2011. The way Williams’ career has panned out, it would not be surprising to see the hard working jockey find his way to a Melbourne Cup victory in the near future. Starting his career way back in 1998 in Wangaratta, Luke Nolan used the early 2000s to rise up the professional metropolitan ranks to become one of the sport’s elite. In 2006 Nolan achieved his first Group 1 victory in the Caulfield Guineas aboard Wonderful World, and has since gone on to win a Cox Plate and the BMW stakes. Being a triple premiership jockey is also a feather in the cap of Nolan, having won it three consecutive years from 2009 to 2012. Nolan will be forever linked with Peter Moody wonder horse, the unbeaten Black Caviar, which thrust the jockey into the spotlight on the mare’s way to an unprecedented 25 wins – 22 of which Nolan rode. Dwayne Dunn has had a long and prolific career worldwide, mounting horses in two different continents on his way to 15 Group 1 victories. After a successful stint in Hong Kong, he returned to Australia in 2004. Within a year he would have secured his first Group 1 victory aboard Undoubtedly. Dunn would go on to win the Blue Diamond Stakes a further three times, making him the undisputed king of the race. With a Caulfield Cup and a Caulfield Guineas victory also to his name, Dunn proved he’s not just a one-race wonder and cemented himself as a jockey to fear. When the name Hugh Bowman comes up amongst punters, the winning horse’s name is usually within the same sentence. A three time Victoria Derby winner, as well as getting the mount on Criterion in 2014 and a win on fiveandahalfstar in the BMW, Bowman knows how to get it done at both country and metropolitan race meets. After having the 2012 Sydney jockey championship ripped away from him after Nash Rawiller stunned the racing world in blistering late season rally, Bowman finally realised his dream and secured his first jockey championship in 2015.